Who says you can’t have a lesson plan for toddlers? Even infants have their own. Training a toddler is a big challenge for most teachers and especially parents since they are teaching young children in the age when they need extra care and patience in order for the training process to be a fun learning experience for them. 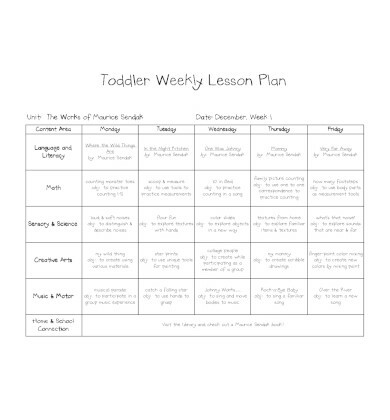 Toddler lesson plans are an empowering tool that enables you to provide them good quality teaching. 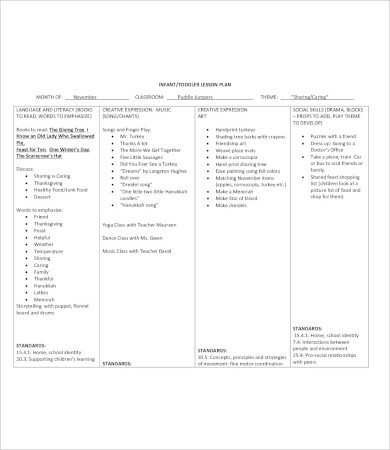 If you have no idea how to make a plan on how to teach young children, it is highly encouraged that you should use the toddler lesson plan templates provided here in this article. 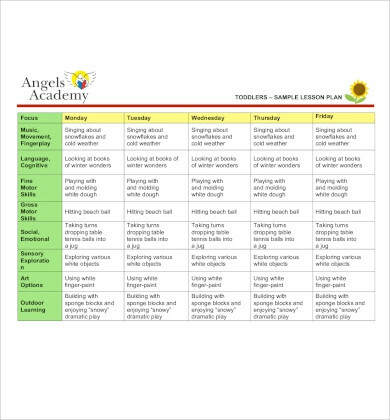 Are you looking for a template that you can use in preparing a lesson plan for toddlers? 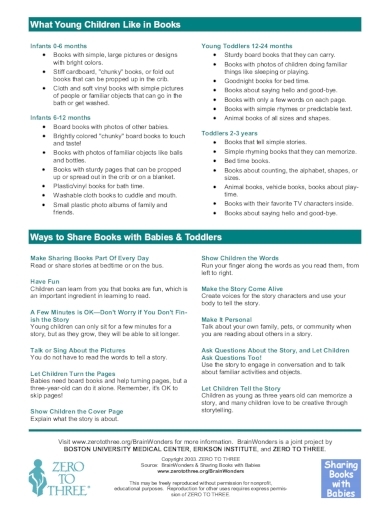 Look no further for we have provided you this toddler lesson plan that can help you with that. 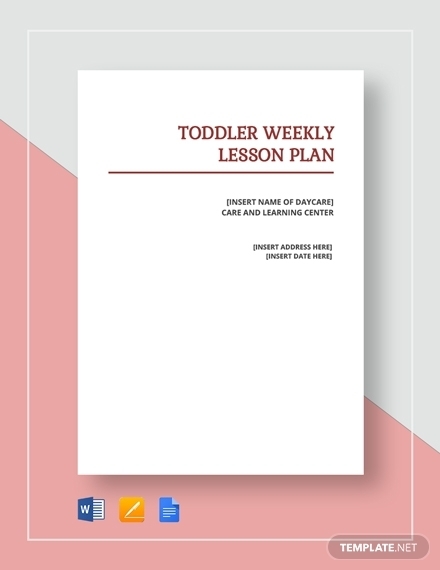 With the use of this template, you can easily create your own toddler lesson plan in no time. 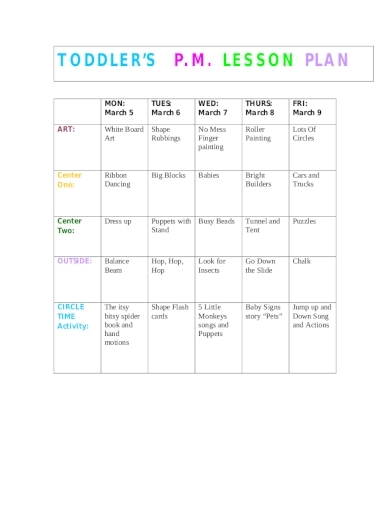 This template is also customizable to suit whatever your needs are or whatever teaching techniques and lessons you have in mind for the toddlers you are handling. Allowing children at an early age to learn basic art concepts and the use of art materials enables them to confidently express through art because for them, art is a language that they can use as a method of communication. Using this art lesson plan enables you to enhance and develop the toddler’s artistic motor skills. And most importantly, it helps you to bring awareness of the world around them and bring clarity and understanding to their ideas by turning their imagination into reality through art. Just when you think you have made the best daily lesson plan for your class, you find out that your pupils think otherwise. Since you are handling toddlers, it is imperative that you have to incorporate fun in your lesson plans so they can easily learn and absorb information. You can always create a lesson plan, similar to the example provided above, that incorporated a certain theme which is about “Day at the Beach.” The activities are then based on the theme such as the singing of songs about the sun (music), making of shells out of paper plates (arts), counting shells and solving puzzles (math), and magnifying and observing sea shells (science). Seeing toddlers starting to learn a lot of firsts such as first steps, first words, and all his or her first efforts at being independent gives you an overwhelming feeling and it will become even more overwhelming if you teach them their firsts yourself. By using this lesson plan, you will make the best and most of the exciting time of a toddler’s life. 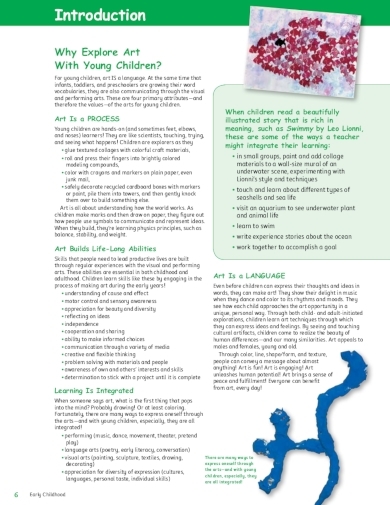 Early experiences shape the brain development of a young child and through this lesson plan, you will be able to supervise toddlers in their time of active exploration and provide them a fun learning experience of first experiences. No one is too young to learn how to love literature. This literacy lesson plan for toddlers makes it possible for you to have a step-by-step process for early literacy learning. It is important to note that early language and literacy development should be done as early as the first three years of a child’s life. Through this, the child would have his or her earliest interactions with various literacy materials such as books, crayons, and papers that will serve as the building blocks of the development of their skills in language, reading, and writing. Humans are naturally social beings and that can manifests as early as first to three years of a child’s life. This is why, as early as possible, you already have to instill social skills to young children and this is possible with the use of these lesson plans that enables you to give toddlers a chance to mingle with other children in order to build their own social skills. 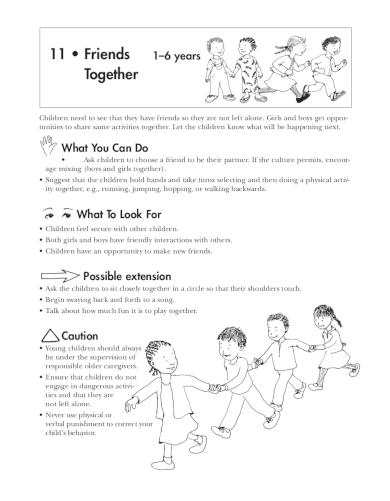 This lesson plan contains activities that provide them the opportunity of making new friends in the early stages of their lives. One of the best ways you can create a month-long lesson plan of your own is to base it around a theme that will also serve as the basis of the activities that you should plot for the entire month. Similar to the given example above, it follows a theme on sharing and caring. This theme basically tries to instill social skills to toddlers in every subject. Even in math, art, music, and language, this month-long lesson plan shows you that you can possibly incorporate a single theme among the subjects in order to conveniently create a consistent lesson plan all throughout a month. Music plays a vital role in all of the areas of a child’s development which includes the intellectual, social, emotional, motor, and language or literacy. Music is also important even in the development of his or her skills that make a toddler school-ready. Since singing and music play is already embedded in most cultures, you wouldn’t have trouble introducing music to young minds. Plus, here is a music lesson plan that will help you not only to introduce music to young children but you will also be able to teach him or her to love music. A study done by the Center for Evaluation and Monitoring at Durham University has shown that, contrary to popular belief, children can actually perform better when they will be taught in the afternoon compared to being taught in the morning. But regardless of the time when you teach them, it will all boil down to the kind of lessons and activities that you provide to children, and with the help of this simple lesson plans, you will have something that can guide you when you will be teaching toddlers, particularly in the afternoon. 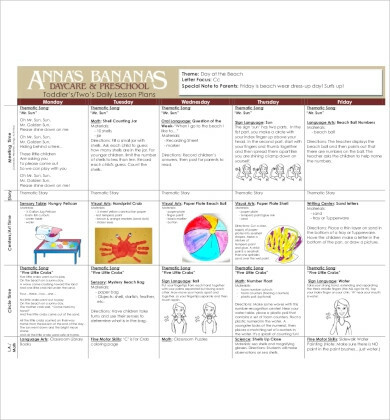 If making daily lesson plans and monthly lesson plans are too tedious for you, then you can always opt for a weekly lesson plan such as this example provided. 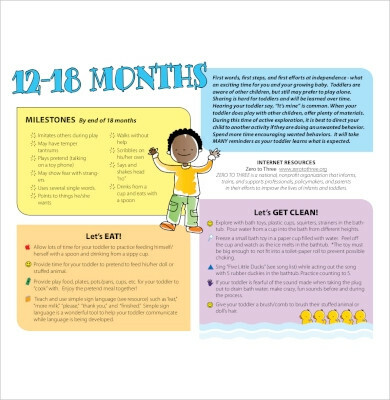 By cutting down your lesson plan to a weekly basis, it will easier for you to determine suitable tasks and activities fitting for toddlers for an entire week. In this way, you will not anymore cram just like how you would when creating daily lesson plans, and you will not anymore make broad plans as you would when creating monthly lesson plans.